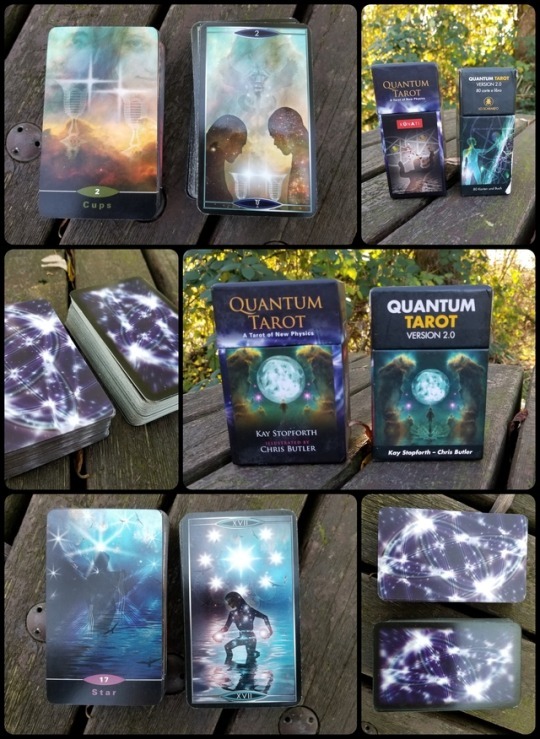 It's such a pretty, cosmic deck! The second edition has a cool feature where some areas are glossed, so as you turn the cards, bits shine out! The first edition was one of my first decks! I used it for a little while but I didn't really understand the meanings, so I've been kind of hanging on to it. I kind of want to get the second edition just so I don't mess up the OOP one! Please use the Helpdesk if you have forum questions! Some of the cards are different (as you can see), but some, like Death, are pretty much identical. I do like some of the cards in the second edition more - the first has a lot of those weird floating x-ray faces that they nixed in the second edition! I don't THINK the second edition has the Universe card. It's got borders, no gilding, and is a smidge smaller. The book for the second edition doesn't have quite as much detail. But there IS that cool glossy effect! ETA: If you, or anyone else, is interested in seeing specific cards from either deck or snippets from the book, let me know! I can definitely add more photos! I'm not great with Tarot symbolism and would much rather read science fact cards as Oracles so got 2.0 earlier this year for use in Tarot exchanges. It still has the full 80 cards including the Universe and Phoenix . Oh good to know! Mine were all out of order and I haven't used them in a while, so couldn't remember. Thanks! All the Court Cards were redone for the 2nd 2.0 edition and I much prefer the 2nd edition as the Courts are made with antique engravings and it reads much easier. Curious deck. Really brings the universe and the cosmic and the personal / intuitive up close. Another major difference is if you’ve got the 1st edition you’ve got all of Kay’s best writing on the cards themselves; what I mean is that the LoS edition, 2.0, reduced the booklet and it’s a shame as you really lose out on a lot of the concept and meaning of the deck. Hang on to your first edition to help you with reading the deck! I wasn't a fan of the weird floating faces that's for sure! I tend to hallucinate and faces pushing themselves out of things is fairly common for me, so those courts were iiiiicky for my mental health! The new version is the one I actually use on a regular basis, despite my frantic search to own the first edition. And yeah that first book is definitely better. I don't usually care for guidebooks, but my base knowledge of science is not where it should be and without it, a lot of what's really cool about this deck would be lost!